Films about superheroes available for home theaters. Continuing our series on great movies that are available on DVD and streaming. Since the Boston Comic Con was this past weekend, what better time to look at some of the superhero movies that are available. The pickings in the the theaters this summer have been slim, so let's take a look at what's available for home viewing. These are some of my favorites from the superhero genre. All of these films were produced in the last 15 years and are listed according to their IMDB ranking (highest to lowest). The Dark Knight Trilogy - Batman has seen a number of incarnations over the years and the Christopher Nolan trilogy has been my favorite. Christian Bale is an amazing actor, and does a great job as Batman/Bruce Wayne. This is one of those rare series where the first film was great, only to be surpassed by its followups. 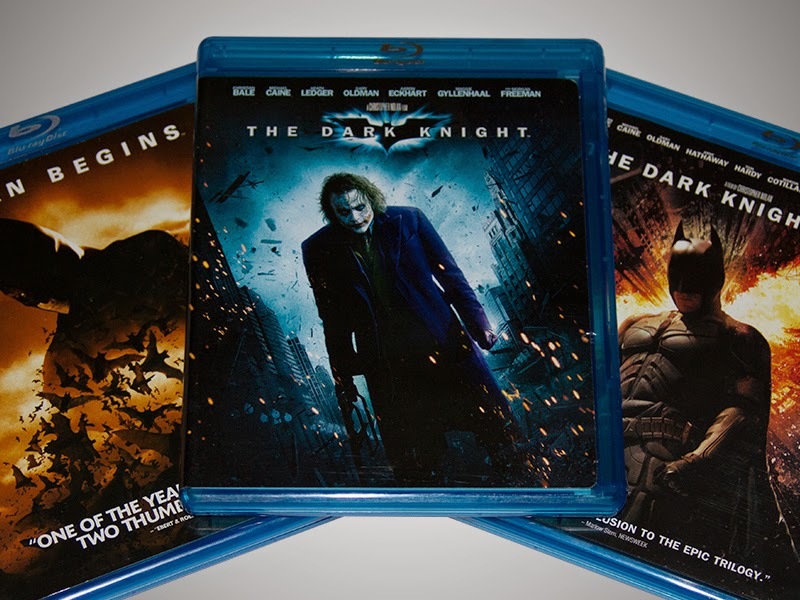 Of the three films, The Dark Knight stands out as the best of the three. In addition to a great story, Heath Ledger's performance as the Joker was amazing. The Matrix - Although The Matrix was technically part of a trilogy, the first film is the only one worth watching. When I mean is that the first installment of the series is completely different from what follows. The followup films play like a two-parter (The Matrix Reloaded and The Matrix Revolutions). These films don't feel as connected to the first as they do each other. Keanu Reeves plays a computer technician/hacker who learns his life isn't really what he thought it was. That in fact, what he thought was his life was just a virtual reality fantasy. The film is a philosophical look at fate versus free will, cloaked in a science fiction, action genre. Iron Man - This is the first film of the Iron Man series featuring Robert Downey Jr. in the title role. Downey does a great job bringing just the right touch of humor into the role of Tony Stark. After being captured in the Middle East and being forced to build a weapon of mass destruction, Tony uses the components and tools he has available to build a prototype of what will soon become Iron Man. This entry into the series is so far the best of the bunch. Watchmen - This film takes place in an alternate reality of the mid-1980's when all of the worlds superheroes have been forced to retire. After one of the heroes has been murdered, Rorschach (a superhero with a lot of anger issues and a very cool mask) begins an investigation. This film is directed by Zack Snyder, the same director who brought us Man of Steel. In my opinion, Snyder did a much better job bringing Watchmen to life. We'll see how he does with his Man of Steel follow-up, Batman v Superman: Dawn of Justice. X2: X-Men United - This was a great follow-up to the original X-Men movie. This film picks up where the original left off and features a military scientist, Col William Stryker, who is bent on wiping the mutants from the face of the earth. Director Bryan Singer is again at the helm for this film. In my opinion, this sequel surpasses the original. This is my list of my top 5 favorite superhero movies. There seems to be a lot of activity for future superhero movies currently in production or pre-production. That may require we update this list some time in the future.